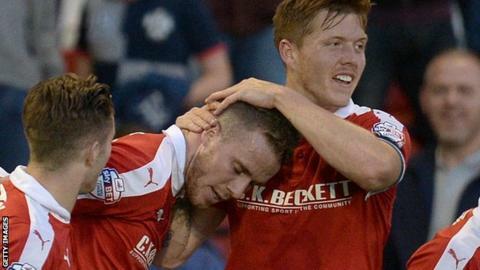 Barnsley fought back against Crewe Alexandra to make it nine wins from 11 games and close in on the League One play-off places. Struggling Crewe went in front when defender Jon Guthrie deflected in Marcus Haber's effort. Match ends, Crewe Alexandra 1, Barnsley 2. Second Half ends, Crewe Alexandra 1, Barnsley 2. Substitution, Barnsley. Shaun Tuton replaces Ashley Fletcher. Attempt missed. Sam Winnall (Barnsley) right footed shot from the centre of the box is close, but misses to the right. Corner, Barnsley. Conceded by Ben Nugent. Corner, Barnsley. Conceded by Oliver Turton. Attempt saved. Conor Hourihane (Barnsley) left footed shot from outside the box is saved in the centre of the goal. Attempt blocked. Charlie Kirk (Crewe Alexandra) right footed shot from the left side of the box is blocked. Attempt saved. Ashley Fletcher (Barnsley) left footed shot from the right side of the box is saved in the bottom left corner. Attempt missed. Ashley Fletcher (Barnsley) right footed shot from outside the box is close, but misses to the left. Substitution, Crewe Alexandra. Charlie Kirk replaces Tom Hitchcock. Lloyd Isgrove (Barnsley) is shown the yellow card. Tom Hitchcock (Crewe Alexandra) wins a free kick on the left wing. Goal! Crewe Alexandra 1, Barnsley 2. Alfie Mawson (Barnsley) from a free kick with a right footed shot to the top right corner. Ashley Fletcher (Barnsley) wins a free kick in the defensive half. Marley Watkins (Barnsley) is shown the yellow card. Marley Watkins (Barnsley) has gone down, but that's a dive. Corner, Crewe Alexandra. Conceded by Marc Roberts. Goal! Crewe Alexandra 1, Barnsley 1. Sam Winnall (Barnsley) right footed shot from the centre of the box to the top right corner.